A friend a work asked me if I could make a Mr. 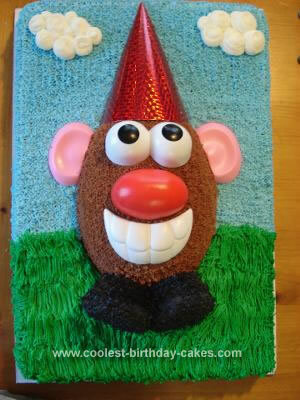 Potato Head birthday cake for her son’s birthday. We were unable to find a shaped pan, so I used the Wilton egg pan and a 12 x 18 sheet cake pan. For the features my friend purchased the large Mr. Potato Head parts. For the feet I used two cupcake that I shaped to look more like feet. To complete the look I cut a child’s party hat in half and placed it on his head. The cake was a hit at the party. This is great. Would never have come up with this on my own! Very nice, but where are his arms?? I made some arms but was unhappy with them, so I took them off. And no one even noticed at the party!